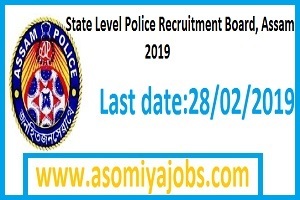 State Level Police Recruitment Board, Assam, invited from eligible and interested candidates to fill up the 68 existing vacancies in the rank of Sub-Inspector of Police (Communication) in Assam Police Radio Organisation. No. of post: 68 (Unreserved- Male-24, Female- 10),( OBC /MOBC-Male- 15,Female-06),(SC-Male- 03,Female-01, (ST(H)-Male-01,Female-00),( ST(P)-06,Female-02). In order to appear for the written test the aspiring candidates must satisfy the following criteria. a) Nationality : Candidates must be Indian Citizen, ordinarily resident of Assam. b) Age: Candidate should not be more than 24 years and less than 20 years of age as on 1st January 2019. (Candidate must be born on or before 01-01-1999 and on or after 01-01-1995). Computer Science or equivalent and 2 years additional course/courses in Telecommunication /IT /Computer Science/ Computer Engineering or equivalent. Applications must be submitted online through Assam Police / SLPRB website (police.assam.gov.in / slprbassam.in). No other forms of application will be entertained.